Thanks! to all who sent Congrats, and to those who have asked to see the "Honorable Mentions". 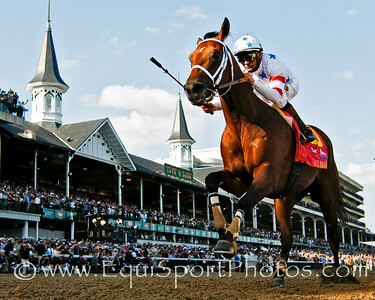 Here's Big Brown winning the Kentucky Derby. This was published in the Daily Racing Form May 6,2008 and was my first Eclipse nom. I feel very honored to be recognized. It's nice to have a bit of credibility for one's work. 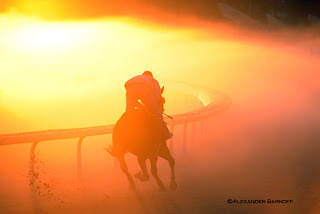 Honorable mention in the Photography category also went to Alexander Barkoff, whose photo of a morning sunrise on the Fair Grounds backstretch was published in the New Orleans Times Picayune on November 9. Congratulations again to Matt Goins, this years' winner, for his other "Bookend". He has spent much of his life in the trade as a photojournalist and is one of the hardest working photographers I know. This second Eclipse Award must be, I'm sure, very gratifying. One needs to consistently know how to "be in the right place at the right time" to get the consistently great shot. Matt knows how to do it. Way to go! Matt Goins' picture, and caption, was posted here on Dec. 30th and appears further down this column. I thought the honorable mentions were much better than the winning photo. Who needs to see another picture of Frankie Dettori doing another flying dismount.